Heidi Trautmann was born in 1941 in Königsberg in eastern Prussia. At the age of nineteen, she spent some years with her father in Angola and Nigeria. Later, she lived with her husband in South Africa for six years, where two of her children were born. She worked there as a conference interpreter, translator and painter together with local artists. Back in Germany in the 1980's, she continued studying art in the studio of artist Rolf Märkl for three years and took part in various joint exhibitions. For four years she worked as a worldwide travel guide for her husband's travel agency. Later she established together with other artists an art and studio house for various disciplines, the “ Werkhof” between Salzburg and Munich. For some years, she organised barn operas, musical events with international artists, literary circles, art exhibitions, pottery, art and craft markets. She then worked as technical author for about ten years. Then it was time to build a sailing boat with her husband. They went off together to live on the boat for six years, and they sailed the entire Mediterranean until they came to Cyprus in 1999. Here, they laid anchor for good in 2001. 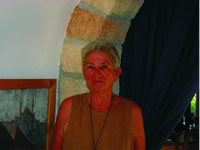 Heidi joined the Levantine Art College in Edremit in 2001 and is still working today with the same group of artists. In Cyprus, she had one solo art exhibition in 2005 and two joint ones in 2006 and 2007. Heidi has written two travel books, one published in April 2005, the second in October 2007, both in German. The third is in preparation. From 2005 to the present, she has been writing articles for local newspapers on art and has been holding interviews with local artists.